How can a network of distinct civic engagement organizations present a cohesive narrative of their network-wide successes? 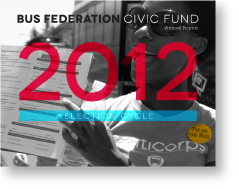 For the Bus Federation, a grassroots network of civic engagement organizations targeting young voters, 2012 was a landmark year. The upstart network mobilized over 10,000 volunteers that drove more than 1.1 million voter contacts, leading to electoral victories for voter rights, marriage equality, education funding, and clean energy. As an innovative and leading network in the civic engagement sector, the Bus Federation had a powerful story to tell. But the network did not have experience translating its narrative to potential funders and supporters. Additionally, as a network of organizations in different states, the Bus Federation lacked a cohesive brand. The network had intentionally promoted the efforts of its member organizations and minimized its own brand presence. The Bus Federation engaged Reboot to help tell the network-wide story of the 2012 election cycle’s successes. The project posed an interesting challenge: how to create a unified narrative of all the Bus Federation organizations without detracting from the strength of each organization’s individual brand? Working hand-in-hand with the network’s team, we produced a powerful visual design to tell the story of their previous year’s accomplishments and provided direction on framing their narrative in a compelling and persuasive manner. The output, an online annual report with an accompanying print version, was distributed widely through the Bus Federation’s member organizations and has since contributed to the growth of the network.